With evidence of cronyism, fraud and underhanded censorship emerging in the last three weeks, a number of video game magazines have entered the crosshairs of a far-reaching corruption scandal. “GamerGate”, as this scandal is coming to be known, has so far driven three game magazines to change their ethics policies in response to the public outcry. At the heart of the scandal was the fact that a collective of feminist activists had come to dominate the major publications in the small world of games journalism; these activists were said to be using their positions to promote their feminist friends in the game development scene, to the detriment of both honest developers and the gamers themselves. GamerGate has been steadily trending on Twitter throughout Europe and North America, as well as in various cities in Canada and the Far East; celebrities such as the actor Adam Baldwin have spoken about it and even mainstream sources such as Breitbart, The Guardian, Forbes, Slate and the BBC have started to report on it, some discussing the corruption in the midst of the game industry and others dismissing GamerGate as a misogynistic attack by socially awkward gamers with neckbeards. One particular article that criticized gamers led to its author, Jenn Frank, quitting her newspaper, The Guardian, after it emerged that she was financing one of the people involved in the GamerGate scandal and was in turn being financed by that person’s close friend. 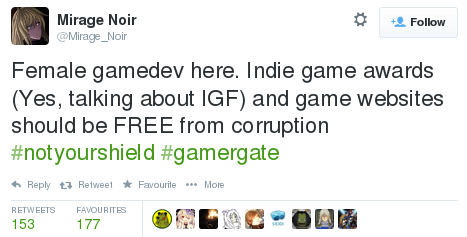 The full details of the recent revelations on GamerGate will feature in a new article on AVFM next week. This article, instead, is about how the very people whom the feminist journalists claim to support have stood up against their would-be protectors. Just as the hashtag #WomenAgainstFeminism came last month to remind feminists that some women refuse to be part of their victim narrative, we are now seeing #NotYourShield, a hashtag written by women, by people of ethnic minorities, by homosexuals, transgender people and all others for whom these journalists have claimed to speak, decrying the fact that the journalists are using them to deflect accusations of corruption. It all started on the 28th of August, when five different gaming magazines published op-eds proclaiming “the end of gamers”. Leigh Alexander, the editor-in-chief of Gamasutra and one of the people implicated in the corruption scandals, wrote that “They don’t know how to dress or behave.”, describing them as “lonely basement kids”, “these obtuse shitslingers, these wailing hyper-consumers, these childish internet-arguers”. She concluded that “Gamers are over. That’s why they are so mad”. Luke Plunkett of Kotaku, one of the magazines accused of corruption, described them as “reactionary holdouts that feel so threatened by gaming’s widening horizons”. Gamasutra’s Devin Wilson stated that “We’re seeing calls to do away with the concept of “gamers” altogether. This is great, but this change isn’t going to happen automatically. ” and that “each of us have a part to play in that revolution if we want it to happen.” Identifying himself as a “social justice warrior”, he called gamers “terrorists”; he argued that game journalists should strive to change the video games medium itself by discouraging online multiplayer games, which he called “isolating“, and should subvert the role of gamers as “vicious gatekeepers” of the gaming industry. 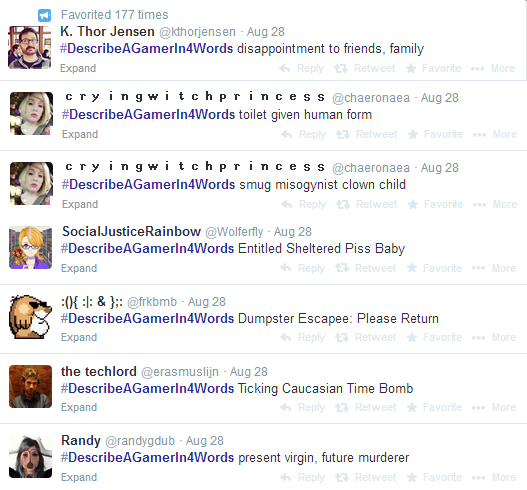 In the same 48-hour period in which these pieces were published, non-gaming pro-feminist websites such as The Daily Beast, Buzzfeed, Jezebel and The Mary Sue published articles likewise ridiculing gamers. They joined together terms such as “dorky and shy and male” and “the black hairball of hatred that is geek fandom” with claims that gamers, as misogynistic white men, were being replaced by a more diverse audience. 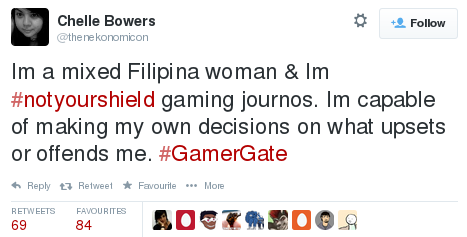 All these websites, gaming and non-gaming, professed to be the protectors of minorities. This inspired many gamers who have been posting on #GamerGate on Twitter to talk about how they were female; how they were black, latino, Asian, homosexual, transgender and just about every identity the “social justice” journalists had claimed to be defending. They began to talk about how well their fellow white, male, heterosexual gamers have treated them in online games, how #GamerGate is all about corruption, not identity, and how they didn’t want themselves be used as a shield for the corrupt game journalists to hide behind. 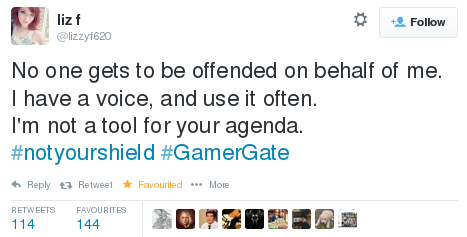 They used the hashtag #NotYourShield to express their views. 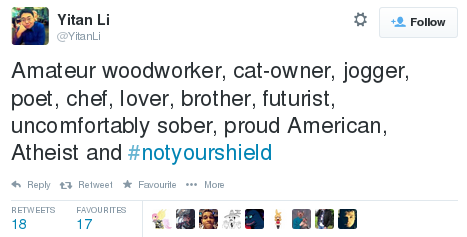 These people and many more have come to the #NotYourShield hashtag, which now has over 30,000 tweets. In the midst of it all, some of the “social justice” people claimed that most of the posts on #NotYourShield were made by sockpuppet accounts. A few accounts did indeed arise during the controversy to tweet specifically on this hashtag and #GamerGate, which shows that they were either sockpuppets or throwaway accounts that helped people remain anonymous. That said, the vast majority of the accounts I have personally looked into have been active since before the hashtag was created and indeed before GamerGate even began. 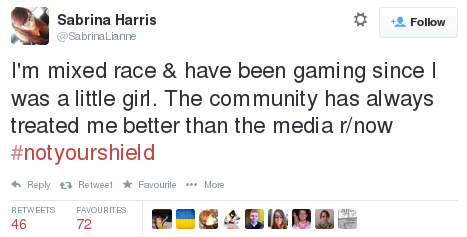 Several blogs and one gaming website have written positive press about #NotYourShield. Taco Justice on YouTube has written two videos on this hashtag, saying “we come from every color, creed, class, sexual identity, gender and country”. One woman’s blog, linked to in a Twitter post on the hashtag, stated that, although she never encountered any sexism in online video games, the incessant stream of articles that claimed misogyny was rampant had discouraged her from playing. Meinos Kaen, an Italian* blogger, pointed out the contrast between #NotYourShield and the gaming press’ insult-driven #DescribeAGamerin4Words hashtag. On the website GamerHeadlines, an article was dedicated to the hashtag; it stated that “Female gamers are speaking up to show that they will not be used as a reason for the gaming community to be scrutinized.”. The blogger OneAngryGamer wrote “For too long the radical left-wingers have been lumping all gamers into one bracket” and “The #NotYourShield hashtag fused with #GamerGate gives us a beautiful rainbow of diversity”. 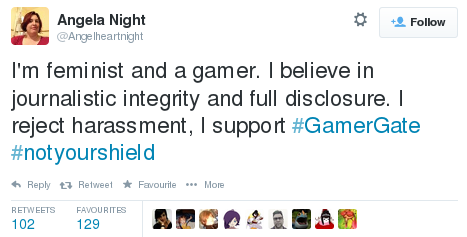 The message of #NotYourShield has been that those who wish to expose the corruption of the “social justice” people stand together, no matter what demographic they come from. It has shown that not all GLBTQ, not all members of ethnic minorities and certainly not all women adhere to the narrative of the mainstream gaming press. They do not want to be called victims, they do not want their identity to be politicized and do not want to see themselves as separate from their fellow white, male, heterosexual gamers. They reject the identity politics that the “social justice” journalists have offered them and instead welcome different form of diversity – the non-politicized kind.